Yesterday I found some time to finish reading Insurrection by Peter Rollins. I'm a little late on my review since the book came out in October of last year but, nevertheless, it was too good not to mention something about it. Rollins has a way of writing that has a disruptive quality. He shocks you, not in a superficial way (like, perhaps, Mark Driscoll) but in a healthy and theologically necessary way. He penetrates our defenses and gets right to the heart of our internal systems of thought. Many books have a way of rearranging our already present priorities, redecorating the space in which we already reside. Rollins sets out to burn the house down and force us to relocate somewhere completely new and outside the borders of our present perspectives and presuppositions. He doesn't just want a revolution, he wants an insurrection against the status quo at the heart level. It has been a while since I've read something so fundamentally philosophical. Rollins, through storytelling and imagination, offers an invitation into a spirituality that refuses to be possessed, exploited, or domesticated by religion (and he has a specific definition for religion). A faith without power except insofar as it is powerless. It's full of backward concepts and paradoxical appeals. Interestingly enough, he calls for a conversion, not an external religious conversion but an internal conversion from certainty to doubt, from upward mobility to solidarity and suffering, from success to love--even love for the "least of these." He invites us to the cross, to experience forsakenness, to let go of our support systems, to let them burn, to strip ourselves of everything we hold dear so that we might live fully in the resurrection. 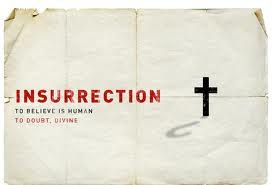 Resurrection is about embracing reality, embracing humanity, rather than trying to escape it. Throughout this book you'll hear echoes of Jesus' invitation to "take up the cross," the invitation into a kingdom without boundaries where the first are last and the last are first. Sure, you'll struggle with some of Rollins suggestions (and I think he'd prefer it that way) but the book is well worth the read and it has the potential to disrupt you and push you right into the bottomless abyss of the God who is love. Great stuff! Perhaps the best thing I've read so far this year.